I know, it’s been a while. This December has been unusually stress filled and crazed but the New Year promises to offer some clarity. The craziness peaked with D’s birthday. Like last year, D decided to have some friends over for eats and drinks. Unlike last year, we decided to step the food preparations down a notch and enjoy our time with friends. We made pizza. Two nights before the birthday I bought, chopped and cooked all the pizza toppings (the food processor is my best friend). The day before the cake was started and the morning of, pizza dough was prepared and meringue was added to the cake-- Much less crazy than it sounds. The day’s events brought pizza of choice to all who attended. The ingredients were on the table and as guests arrived we rolled out dough and people created pies. Everyone (seemed) to enjoy it and really, there is little better than fresh, warm, homemade pizza. The smell alone will drive you to drooling. The highlight of the evening was by far the birthday cake. While D insisted on Red Velvet, I decided if I was making the cake, I was making something even more special. Many foodies (and even some non-foodies) have realized that cupcakes have been all the rage in the past two years or so. There are multiple cookbooks devoted solely to cupcakes, a blog and in New York City, there is even a restaurant called Cupcakes and Burgers. Why do we love cupcakes? Who knows, but here is some possible insight: They are small, and we all know small food is cute food. They are individually sized (so it’s all equally me, me, me! )—or just the perfect serving, and they are easy to decorate (and if you mess up you have plenty more to try again). Here in New York, I am fortunate (or not) to work in a foodie-friendly environment. We swap foodie tales and foodie destinations and sometimes we even take an extended lunch to head on down to Billy’s Bakery for a Red Velvet cupcake for a late afternoon pick-me-up. The favorite is by far the Red Velvet. I brought one home to D one day and he was hooked. The striking red of the cake is beautiful against the pristine white of the cream cheese frosting (it would even make a fabulous Christmas cake for next year!). With a hint of cocoa they are perfect for the chocolate cake-vanilla frosting set as well as the vanilla cake-vanilla frosting set (sorry chocolate frosting lovers). Skip ahead a few months and one of D’s office mates brought Red Velvet cupcakes into for all, proclaiming they were Billy’s Red Velvet and no red food coloring is used to make the cake brilliantly red. That in fact, it is the reaction of baking soda with cocoa powder that turns the cake it’s ruddy hue. D ran home with the news to which I skeptically stated I was sure there was red food coloring in nearly every recipe of Red Velvet I had looked at. Further investigation revealed that this was once the cake. Today’s cocoa is processed in such a way that the red reaction no longer occurs but it is where we receive the term “Devil’s Food Cake”—or as we know it, delicious chocolate cake. So, today, in order to keep its bright hue, we add a good 1-2 tablespoons of red food coloring to our Red Velvet Cakes to ensure their brilliance is wowing. So D was pushing for Red Velvet but I pushed (and ultimately won since I was baking) for the above pictured cake: Blackberry Chocolate Cake with Blackberry Meringue Frosting. It also helped that I found an amazing deal on blackberries that week ($1 per pint!). To make it extra special I purchased100% cocoa powder from La Maison du Chocolat for a hefty price. The cake tasted better than it looked and everyone especially loved the fresh blackberries inserted between each layer (4 layers to be exact). While it all sounds complex the most involved part was sieving fresh blackberries for the cake batter. All else was a breeze—even assembly. My boss passed this recipe on to me with the warning “it’s a very special cake.” Well, the cake is amazing with a rich chocolate cake and surprisingly thick, yet light and fruity frosting. The recipe, I believe, is from Saveur Magazine. It is claimed to [gluttonously] serve 10 but is more like 15. This is the recipe as it was given to me. Serves 10. Active time= about 2 hours. Inactive time= about 1 hour. Can be made the day ahead and kept at room temperature. 1. Make the chocolate cake: Preheat oven to 350F. Coat two 9-by-2-inch round cake pans with vegetable oil spray and line the bottoms with parchment paper. Lightly spray the paper. In a large bowl, sift together the flour, sugar, cocoa, baking soda and salt. 2. Pass the blackberries through a fine strainer set over a bowl; you should have about 1 cup of puree. Whisk in the buttermilk, oil, vinegar and vanilla to the puree. Pour the blackberry mixture into the dry ingredients and mix until just combined. 3. Divide the batter evenly between the prepared pans and bake for about 40 minutes, or until the cakes pull away from the sides and the tops spring back when pressed. Let cool on a rack for 10 minutes, then unmold and cool completely. 4. Make the blackberry filling: In a large heatproof bowl set over a saucepan of simmering water, whisk the egg whites with granulated sugar and cream of tartar until the sugar dissolves and the whites are hot to the touch, about 5 minutes. Transfer to a standing mixer and beat at high speed until the meringue cools to room temperature and is very thick, about 15 minutes. Stir the blackberry preserves until smooth, then gently fold 1 cup into the meringue. 5. Using a serrated knife, split the cakes in half horizontally. Thinly spread the remaining ½ cup of preserves on 3 of the cut cakes layers. Set one of the layers on a large plate, preserve side up. *Spread one-third of the meringue on top and press one-third of the blackberries into the meringue. Repeat with the remaining preserve-spread layers and the remaining meringue and blackberries. Top the final cake layer and let stand at room temperature for 1 to 3 hours. 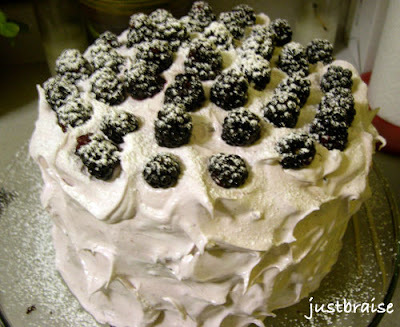 Just before serving, sift the confectioners’ sugar over the top of the cake and garnish with additional blackberries. *The amount of meringue created in this recipe was astounding. Instead of dividing it into thirds, I essentially divided it into fifths. Each layer received one-fifth and the remaining fifth covered the outside of the cake. I then topped the meringue with a final blackberry layer and sprinkled with confectioners’ sugar. I felt the cake looked more finished this way too—though you don’t see the layers until sliced. The short and simple of it is that I was craving some Rocky Road Ice Cream the other day. Surprisingly, it's never been a favorite and I more often lean towards a mint based creation or black and white milk shake when it comes to ice cream indulgences. The other night, it was Rocky Road. The craving quite possibly was ignited by the need to use up some marshmallows left over from a late fall camping trip. They have been staring me down, mocking me with their fluffiness for a few months now. "How about sweet potatoes?!" You say. As sweet potatoes go, I like them mashed or in a plain pie, no added marshmallows as I believe sweet potatoes are strongly sweet on their own. So I thought brownies or Rocky Road Cookies. I knew I had all ingredients for cookies, so cookies it was. But wait, there is no peppermint in Rocky Road. Well, in holiday Rocky Road there is. Or more likely, I was needing to rid myself of a stagnant pile of peppermints (a la the dark chocolate peppermint bark) that have been sitting around longer than I care to mention. This recipe is (very slightly) based on those delicious Cranberry Macadamia White Chocolate Chip Cookies. I added cocoa powder to the batter to give them a chocolate base. More should have been added to really pump up the chocolate in this (which is why chocolate chips were added). When baked, the marshmallow oozes out of the cookies and provides a sweet crisp crunch along the edges which was a pleasant surprise. 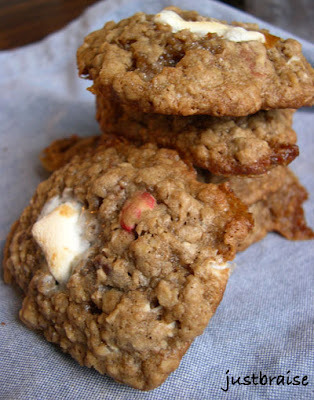 These cookies are chewy and a sweet meal in themselves! 2) In a mixing bowl, whisk together flour, baking soda, baking powder, salt and cocoa. 3) With an electric mixer in another bowl, add butter and sugar, mixing until fluffy. Add the egg and vanilla, mix until well combined. 4) Beat in flour mixture until well combined. 5) Add remaining ingredients and stir until evenly combined. 6) With a spoon, drop dough about 2 inch apart. Top with an extra piece of marshmallow. Bake in batches in middle of the oven 10-12 min (or lightly golden) for soft cookies. Cool on racks. I rarely to never steer you from foodie love but I've been quiet and for good reason (besides, there will be food if you come). And... ti's the season for gift giving to yourself and others-- you need beautiful things to serve your delicious creations on, yes? If you live in or around NYC come on down to my studio's Holiday Art Sale!! Join us! Eleven ceramic artists gather for one last show (our studio is closing to make way for luxury condos). N,W or 7 to Queensboro Plaza. Use Queens Plaza South exit to street. Walk straight ahead to 28th St and turn right. The building is at the end of the block on the corner of 28th St and 42nd Rd. E,R or V to Queens Plaza. Use Queens Plaza South exit to street (the middle of the train is nearest this exit). Walk straight to 28th St. and turn left. The building is on the right at the end of the block on the corner of 28th St and 42nd Rd. G to Court House Square. Walk north on Jackson Ave and turn left onto 42nd Rd. The building is straight ahead on the corner of 28th St. and 42nd Rd. Last Thanksgiving I was in Chicago when some family friends gifted us a tin of Williams Sonoma Peppermint Bark. It was so frighteningly addictive that I was eating sheets of it a day. My mother forced me to take it home to New York City and it was gone in a matter of days. Little did I know that this might just be the easiest dessert to put together. I'll be making it again in white chocolate/ dark chocolate layers (a la Williams Sonoma for a fraction of the cost) for my ceramic studio's holiday sale, but just had to get this out to you now to create and be swayed by paying $25 for a box at the store! 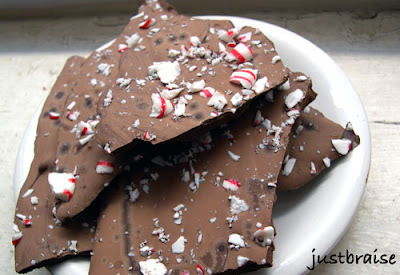 If you have some chocolate lying around and some peppermints piled up nabbed from restaurants, this is perfect use for them. It is one of those recipes people will think you bought or spent all day laboring over and you will tell them you did and laugh to yourself. It would make a perfect holiday gift for friends—just buy a nice tin at the dollar store! I will not even put quantities down because however much chocolate you have can be used and the peppermint quantity will depend on how strong you want the final product. Qty Depends on amount of chocolate used. Active time= 10 minutes. Inactive time= 6 hours-overnight. 1) Lay parchment paper on a cookie sheet. 2) Put peppermint in a paper bag and wrap with a clean dish towel. Use a hammer to crush the peppermint into pieces from dust to chunks. 3) Melt the chocolate in a double boiler*, add the peppermint extract and mix as it melts. 4) Once melted, pour onto parchment paper and use a spatula to spread chocolate about ¼ inch thick. Sprinkle with peppermint and allow to dry 6 hours to overnight. 5) Once dry, break chocolate apart into uneven chunks, store covered. * If a double boiler is not available use two non-stick sauté pans. One should be larger and filled half way with water, brought to a boil. Place the smaller pan on top of the water, without it touching the other pan and melt chocolate in the smaller pan. I was never a very big fan of cornbread. I had it at restaurants slathered in butter, sure. More often than not though, I preferred filling up with a heaping spoonful of mashed potatoes or thick creamed spinach. Delicious. Cornbread was too often dry and overly crumbly and needed too much butter to be palatable. That, or an attempt to moisten it with jalapeno peppers just made it soggy instead of giving it a due kick. Well, D is a southern boy who likes his cornbread. Come to think of it, because of his Indiana roots, it’s really corn that he loves-- In any form, preferably fresh. Well, we’re out of fresh corn. The junk the markets are hawking as “late summer” corn is limp, withered and disgusting. So we turn to cornmeal for our corny fixings. Since D has been around, I have been quite surprised to see just how far cornmeal can go. It appears in our mainstay breakfast pancakes and pops up in light fries like battered calamari. Over time I have begun to think highly of cornmeal and thought maybe cornbread should be given another try. And so, with a little leftover thyme and a new cast iron pan c/o my mother, some “I  Cornbread” was created. 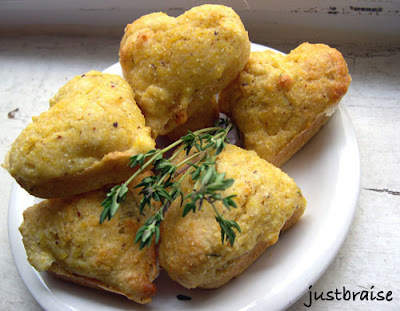 When warm and fresh with a dab of butter this cornbread is moist and delicious. The thyme imparts the perfect herby sweetness to the final product making you think you might just be eating healthy—although even better with a side of cracklings. Makes about 12 sticks or small muffins. Active time= 10 minutes. Bake time= 15-20 minutes. 2) Sift flour, baking powder, sugar and salt together in a medium bowl. 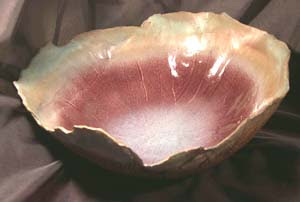 4) In a separate bowl beat the egg. Beat into it the butter and milk. 5) Combine all ingredients with a few quick rapid strokes until evenly combined. 6) Carefully remove pan from oven and place batter in hot pan about ¾ of the way full. Bake 15-20 minutes until just golden on top. Serve immediately.